Tales From the Crypt’s sound stage and production office was located above a Rolls-Royce garage. A concrete ramp led to the roof of the garage at such a steep angle that all I could see was the gray-brown sky of West Los Angeles. Once I crested the hill, though, the familiar village of a movie set greeted me: white moving trucks, Star Waggons, hurried guys with Makita drills and tool belts. The sound stage was a giant warehouse. Dozens of people scurried around, building the next set or shooting on the current one. Walkie-talkies squawked and nicely dressed, less harried folks wandered back and forth through a glass door on the far side of the warehouse. I followed them through the door to the production offices. Inside the offices lining either side of the hallway, important people solved pressing problems like why craft service had twist pretzels but not stick pretzels, and what about air-popped popcorn? You know Joel is dieting, for Christ’s sakes. Up the hallway I walked, until I found the small office where my interview happened. I finished the forms and then walked to the photocopier. 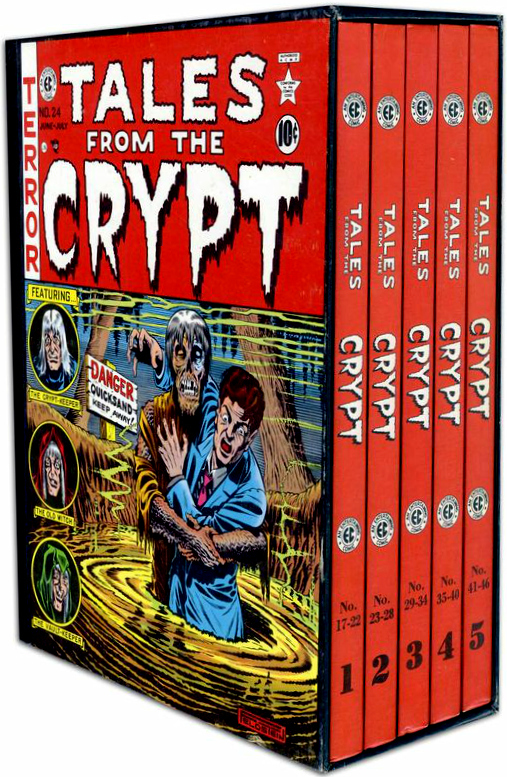 A young man stood in front of the machine, copying pages from hardbound collections of EC comics. “Is this show based on old comics?” I asked. “Yeah. What did you think?” he asked. Walking into Deluxe’s shipping/receiving department was my first peek behind the scenes of post production. Octagonal film cans lined the counter like bulky tin soldies; flat white boxes the size of small deep dish pizzas were stacked about like John’s Tetris pieces. Reading the labels on all of the boxes was like a sneak preview of the following year’s movies. The clerk handed me a stack of boxes and made me sign for them. I felt an odd bit of ego creep in: I’m James Stafford, official signer for Tales From the Crypt. The Post Group was just down the street from Music Plus. I followed the receptionist down the hallway, peering into darkened rooms as I went. Busy people worked in front of television monitors while less busy people sat silently behind them. Labels bearing the names of their shows were stuck to the office doors. “Is that the Pee-Wee’s Playhouse?” I asked the receptionist. “Oh yeah. He’s here all the time,” she said. “I don’t know where any of that is,” I said. “Just go to the front gate on Melrose. I’ll leave your name with the guard. Ask him how to get to Walter Hill’s office.” Walter Hill. The Warriors. Streets of Fire, 48 Hours. Friday I was selling records, and today I was getting directions to the office of one of Hollywood’s biggest directors. The guard at the Paramount gate checked my name on his clipboard and gave me directions to Walter’s office. I drove across the lot and parked next to the cars that Nick Nolte’s and Eddie Murphy’s characters drove in 48 Hours. Inside were two offices. The one on the left bore a placard that read “Michael J. Fox.” Inside the office was a Pepsi machine, but no sign of Michael J. Fox. On the other side of the hall was a door marked “Walter Hill.” I walked in and handed the videocassettes to the receptionist. “Can you tell me how to get to the Tales cutting room?” I asked. Just before the building with the outside stairs I passed a parking space marked “Parking For Jake Gittes Only.” Inside the building I passed a few rooms labeled The Two Jakes before I found the Another 48 Hours cutting room. A man with a ponytail sat at a strange desk with three screens affixed to its back.. Reels of film spun on turntables atop the big desk, threading their way through a labyrinth of sprockets and rollers. The man pressed buttons on the machine that made the film move forward and backward, fast and slow, and the image on the center screen moved accordingly. He marked the film with a grease pencil, pulled it loose and pressed it into a chopping block on the desk in front of him. About a foot of film was removed along with what looked like magnetic audiotape affixed to clear film stock. He hung both on a hook attached to a green, cloth-lined bin with “Desilu Productions” stenciled on its front. A tiny Japanese woman sat silently behind him. She turned and saw me watching them, the stack of film boxes in my hands. She walked over and took them from me. “Thank you,” she whispered, and she closed the door. I drove back to The Post Group and made my way upstairs to Michael the Banana Man. “Where have you been? Steve’s looking for you,” he said. I sprinted down the hallway and turned the corner for the stairwell. A man coming up the stairs and I bumped chests. He grabbed the railing and steadied himself. “Sorry,” I said. “No problem,” he said, and he put his head down and kept walking. I still wonder what my Iife would be like if I accidentally killed Pee-Wee Herman on a Hollywood staircase. Home. 🙂 You are probably the only person who got an actual “Thank You” from Yoko S. – I never got much past a curt nod. I suspect she thought I was a moron. I kind of was. My favorite memory of Yoko was that she was four foot negative seven, yet she drove the biggest car ever manufactured. I always wondered how she reached the pedals. You remember everyones car! I never saw Yoko’s car, but I did see her pop out of a trim bin where she had been on the hunt for one lost frame of film, big (rare) smile on her face, saying, “Found it!” I had thought the room was empty and nearly fainted, it scared the hell out of me. The world would have stopped spinning if you had killed Pee Wee that day! Loved this one.